Traditional plastic plant label to push in, but also with a hole for hanging or tying on to a branch or stake etc. This label is currently available in eleven colours - Black, White, Violet, Orange, Purple, Pink, Mid Green, Blue, Yellow, Red and Sage Green. Sage Green is exclusive to Wells & Winter and blends in superbly in the garden. 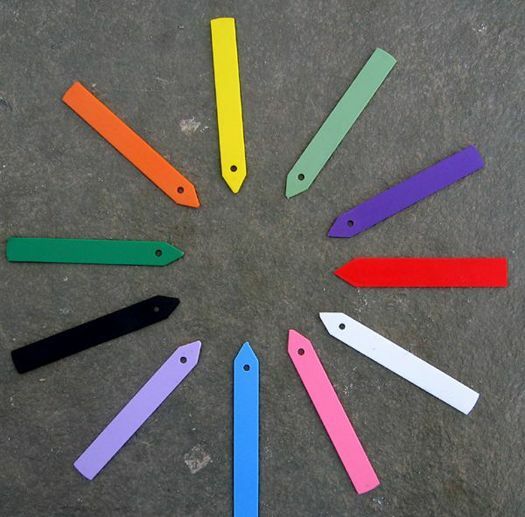 The different colours are useful for colour coding your seedlings. All these labels, which are made in the UK, have a slightly rough to the touch feel. This helps the writing 'grip' better than on the shiny labels available from others. You can mark these labels with pencil or felt tip.